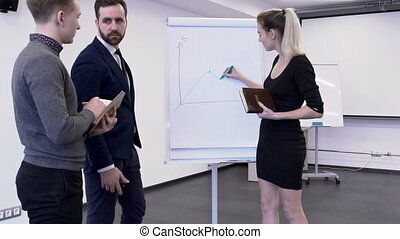 Businessman Is Giving Tasks To His Male And Female Interns In The Office. 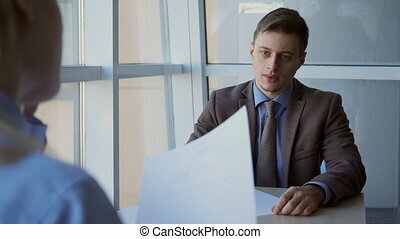 Businessman is standing in his office and waiting for the colleague. Handsome man with beard is wearing suit and tie, has blue eyes and looking into the distance. Male intern is sitting at the desk in conference room behind the boss and correcting paper report. Woman is sitting in office having work interview or meeting. Trying to get job female is concentrated on making good impression carefully thinking over words and movements. Being perfect employee she wants to show all skills, abilities and opportunities in company development project. She is wearing long loose blonde hair and classic formal clothes such as sky blue shirt. Men sitting in front are discussing candidate, all advantages and disadvantages. Male is presenting new working project standing in front of colleagues. 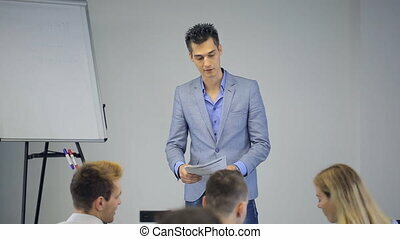 Young business man is showing plan of work reading aloud some important issues and point of company development for better work and growth. Standing in office next to whiteboard he is talking about different questions for helping others. He is wearing short black hair, grey suit jacket, sky blue shirt jeans and massive steel watch. Audience is about males and female sitting and listening. 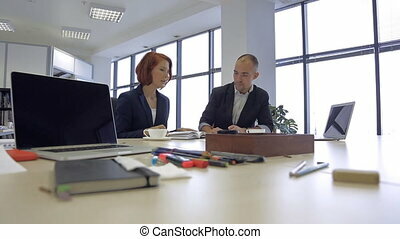 People discuss working details in office in day time. They decided to organize meeting to consult with each other about better variants of development strategy of their company. 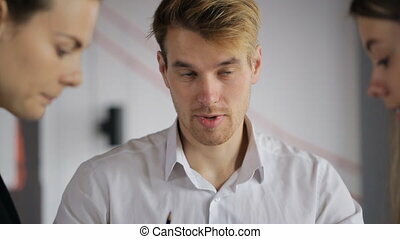 Blonde man with slightly disheveled hair, who sits in middle, explains his point of view to his colleague which concerns their work. Male nervously licks his lips and keeps on speaking, looking at female who is on left side from him. Another woman talks about her ideas to listen opinions of her coworkers. 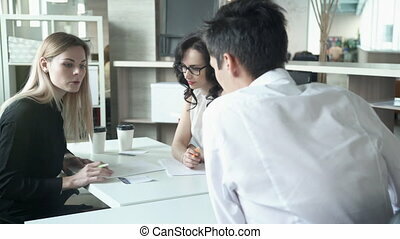 A pair of young office workers male and female, discuss a new concept of development of company standing at window. Attractive blond woman in light blue shirt is talking to his counterpart, man in black shirt. 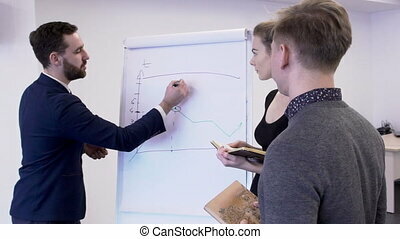 Man tells her about a new idea which can attract new investors to their company, and woman listens with rapt face and nods agreeing with a good idea. They stand near windows in office next to them is another employee, maybe he's eavesdropping and spying on them. 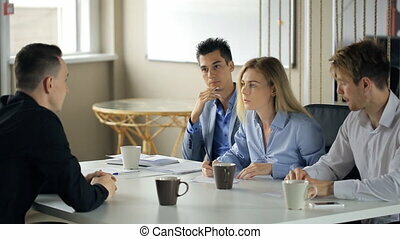 Group of people organise brainstorm in office to share ideas with each other. They sit at white table all together which is full of sheets of paper with schemes on them. Blonde woman, who settles in middle, distributes documents between participants of discussion. She and her colleague, dark-haired man who sits on right side from her, keep slate-pencils in their hands to make notes during conversation. Every person has cup to drink some beverage from it. Two colleagues work in office sitting at table. People are serious and concentrated because they need to finish report till evening. Brunet in gray jacket with slightly disheveled hair quickly writes text by slate-pencil that he keeps in his right hand. 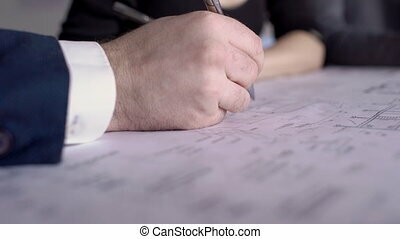 Blonde woman in blue shirt attentively looks through various kinds of documents to find neccessary information. Her beautiful long fair hair fall down on chest. Female is little bit tired but she have to continue to end her task in time. Office workers meet during coffee break to discuss working details. Blonde woman in blue blouse, who sits in middle, asks questons to man in black shirt, that settles in front of her. She keeps slate-pencil in her right hand to take notes in documents during conversation. Her colleague in gray jacket smiles happily and thoughtfully spends arm over face. Another male, who is situated near female, actively takes part in dialog and shares his opinion with others. 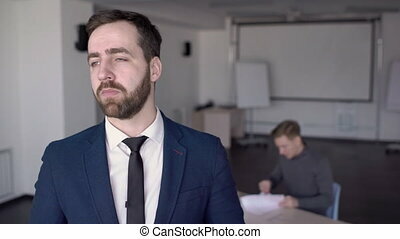 Man is offering business decision to boss standing nearby. 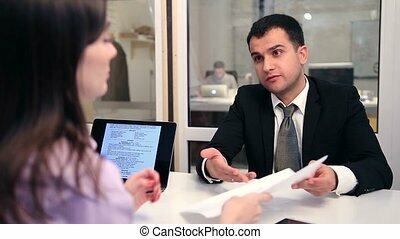 Female is listening to male subordinate sitting at desk talking about company development, co-working perspectives and work with documents, papers and blueprints pointing some important parts. He has short light brown hair made in modern stylish hairstyle wearing dark violet long-sleeved jumper and female white classic sleeveless blouse of thin cloth and pencil skirt. 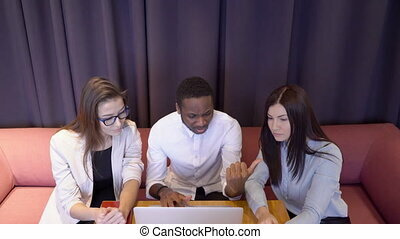 The afroamerican boss explains his female subordinates how to work on the financial report. The three analytics sit in the cafe during the break and look at the screen of the laptop learning new technology. 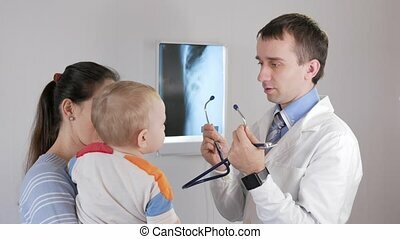 One lady wears white jacket and glasses and the other is in blue shirt.